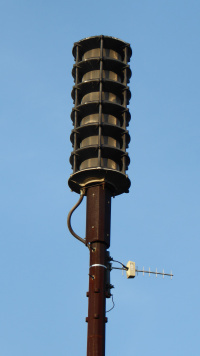 The Early Warning Siren System for the Surry Power Station is comprised of at least 71 Whelen WPS-2806 and WPS-2906 sirens, located throughout Surry, Isle of Wight, James City, and York counties, and the independent cities of Williamsburg and Newport News. The sirens replaced a system of Sentry 10V2Ts over a transitional period from 2006 to 2007. Three new locations were added in 2012 at the request of James City County, bringing the total number to 71. The system is tested on the second Wednesday of March, June, September and December at or around 11:10 AM, in 3 minutes of alert. The system has three activation points - dispatchers in James City and Surry counties, and the Virginia Department of Emergency Management's Emergency Operations Center in Richmond. It uses a sequence of three activation signals, resulting a distinct "triple windup" sound. Most sirens were supposedly upgraded to 560 Hz ESC-2020 controllers in 2011; however, siren #22 still had a 465 hz-based controller as of June 2014, and siren #3 was also discovered to have a 465 Hz controller in March 2016, so it is possible the system has always been mainly 560 Hz. This page was last edited on 31 May 2016, at 03:18.